It is unclear exactly when skiing really originated. Cave drawings show that during pre-historic times, people would use boards under their feet to transport themselves over snow. It was certainly not a sport then but a way to keep on top of the snow. The oldest remains of skis were found in Sweden in the form of boards that more resemble broad snow shoes then the narrow skis that are used today. We offer the best of guided Backcountry Skiing, Ski Mountaineering, Ski & Snowboard camps, & Ice Climbing, & Winter Climbing/Instruction in the Tetons! Untracked powder for everyone! 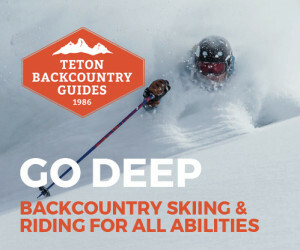 Escape the Resort with professional ski & snowboard guides who focus on fun & educational backcountry skills. Check out our Yurt-based Camps! 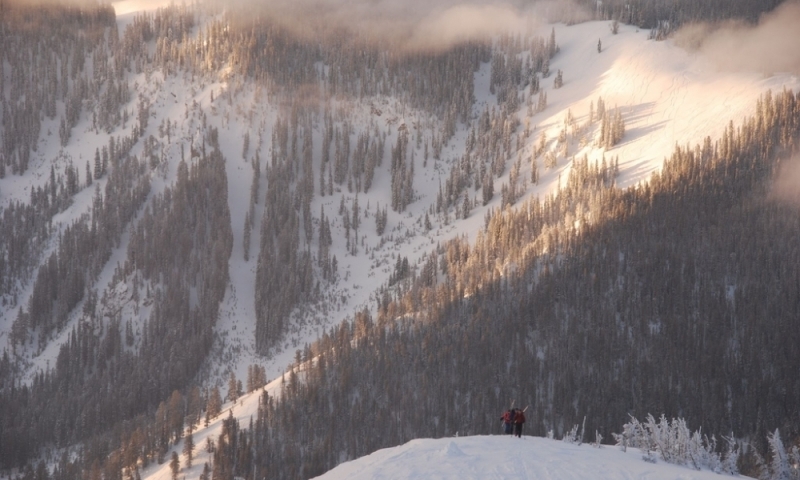 Join a local pro and head into the mountains for a day of backcountry skiing, rock climbing, or mountaineering. 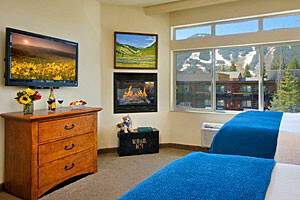 Many multi day courses and trips available. Located just off of the Town Square, Skinny Skis is a fully equipped shop with all the nordic, backcountry, or resort skiing gear and rentals you'll need. Just off the Town Square, Teton Mountaineering has all the gear and rentals you'll need for a day in the mountains, whether you are climbing or skiing. Telemark skiing, sometimes called "free-heel" skiing, originated from the Telemark region in Norway. Sondre Nordheim, of Morgedal, Telemark, discovered the perfect heel strap in 1850. He cleverly entwined shoots of the birch tree root to create a heel strap that has enough stiffness to provide sufficient control of the ski to steer it and enough elasticity to stay snugly around the heel to keep the toe in the toe-strap, even going off a jump. The strap made it possible for both modern downhill and ski jumping. In 1868, Nordheim revolutionized the way skis looked by making his skis more narrow at the middle thus introducing the sidecut for the first time. He also added the heel strap so that the entire foot was now connected with the ski. The new shape and better attachment gave him more control and manueverability. The telemarkers were able to revolutionize the way turns were made in skiing inventing both the Telemark turn and the Christiana turn. The new techniques and equipment changes of the Telemarkers were probably the biggest revolution in skiing. Many skiers look with respect and awe at Telemarkers, admiring both the grace and skill that is connected with this form of skiing. Telemarking has grown a lot in popularity through out the world with more specific equipment and lessons becoming available to more people. People who ski with a free heel will notice how turns are much more a full body movement than in alpine skiing. It is heavier on the upper leg muscles and you will need good balance to progress in Telemarking. Telemarking trademark can be recongized by a couple of characteristics. The heels of the boots are not connected to the skis. The bindings are only attached at the toe end. In turn, the heel comes free of the ski base and seperates the skis by moving one ski forward and the other backward. This forces the knees to bend causing the typical Telemark position. People bend their knees in various degrees, with some only bending a few inches and others almost touching the base of their skis with their back leg. Special gear is required for Telemarking. Your boot and binding combination must be a free-heel system allowing your heel to lift up from the ski surface. Many regular alpine skis work for telemarking. Just make sure to use relatively wide skis that are not too long. 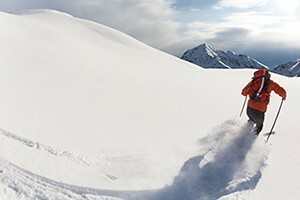 Telemark specific skis are usually less stiff than alpine skis. The only way to learn telemark skiing is to try. Watching others and having advice on body movements and balance can help, but it is ultimately a feeling of the turn and the balance that will come with pratice. Once you connect with your first turn, there will no turning back. Telemarking is the most natural form of skiing and the saying holds true - free your heel and free your mind.